The website Apartment Therapy had the chance to check out an incredible London flat featuring a library that would make any bibliophile salivate. The architects literally extended the apartment into the empty loft above — thus creating an extra bedroom. To get to this new lofted room, they built a “secret” staircase hidden from the main area of the flat. 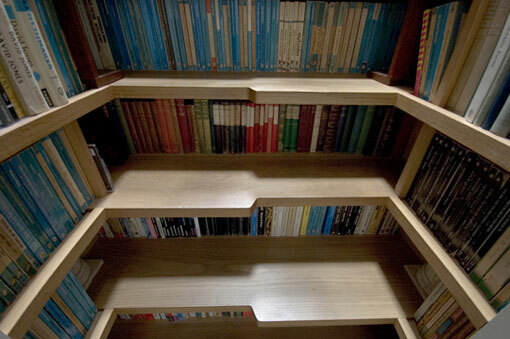 But the real ingenious behind this space-saving maneuver is how they managed to squeeze hundreds of books into the staircase creating their very own library. As you can see, all kinds of books pad the wall and vertical space. Whether under the steps or lining the wall, this is a sight to behold. It’s amazing how much space they salvaged — otherwise large bookshelves would be needed to hold everything. Yeah, it’s nerdy. So what? Check out the rest of the images (especially the shot from above at the top of the stairs).